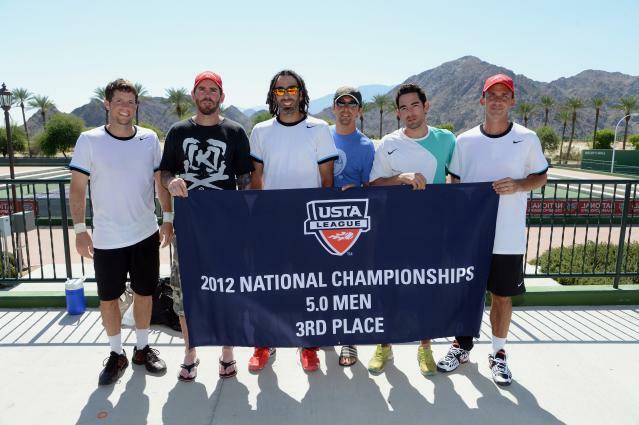 INDIAN WELLS, CALIF., Sept, 30, 2012 – The men’s tennis team from Phoenix, Ariz., representing the USTA Southwest Section, recently finished third at the USTA League 5.0 Adult National Championships held at the Indian Wells Tennis Garden in Indian Wells, Calif. The Southwest team finished 3-1 in their pool, defeating squads from USTA Southern (Atlanta, Ga.), USTA Pacific Northwest (Seattle, Wash.), and USTA Caribbean (Puerto Rico), but fell to USTA Missouri Valley (St. Louis). The Southwest team record, combined with their matches won/sets won combination, got them into the semifinals, where they fell to eventual champions Northern California (Sacramento-area) 3-0. In the third place match, Southwest downed Southern for the second time in the tournament, 2-1. The team was captained by Todd Thurston and featured Mike Mackay, Jared Jacobs, Mark Naprsteck, Matt Jacobs and Jesse Ponwith (L-R in photo below). The team played out of the Camelback Village Racquet and Health Club in Phoenix, Ariz. The team posted an 11-2 record on the season, going 6-0 locally in Central Arizona leagues, 2-0 at the USTA Southwest Section Championships in El Paso in August, and then 3-2 at nationals. The top four teams in order of finish were: Northern California, Florida, Southwest and Southern. This year’s USTA League 5.0 Adult National Championship has drawn the top 27 teams (15 men’s and 12 women’s) from throughout the nation. Head Penn Racquet Sports is in its 25th year as official ball of USTA League. The USTA is the national governing body for the sport of tennis in the U.S. and the leader in promoting and developing the growth of tennis at every level -- from local communities to the highest level of the professional game. A not-for-profit organization with more than 785,000 members, it invests 100% of its proceeds in growing the game. It owns and operates the US Open, the highest attended annual sporting event in the world, and launched the Emirates Airline US Open Series linking 10 summer tournaments to the US Open. In addition, it owns approximately 90 Pro Circuit events throughout the U.S, and selects the teams for the Davis Cup, Fed Cup, Olympic and Paralympic Games. The USTA philanthropic entity, USTA Serves, provides grants and scholarships and helps underserved youth and people with disabilities. For more information on the USTA, log on to usta.com, "like" the official Facebook page facebook.com/usta or follow @usta on Twitter.